"When I worked there, the comp card room was full. Meaning that no comp cards had been sent out." I used to work for Millenium Model Mangement ... I signed a non-exclusive contract (thank God) with them in 2003, and since then I have not received one phone call. I worked with them last year. I left because they didn't need me anymore, and they needed someone who could commit fully to the job of [...]. I am now trying to withdraw from their agency; I am going to send a withdrawal letter ASAP. I have written it, but I am not sure if I withdraw if I will be able to get my money back. As a client I received no work. They charged me $1,500 for my portfolio. I have since been approached by better and more reliable representation and they remarked that even though my photos were good, I couldn't possibly get work because it didn't concentrate on my face. I am disgusted. I wanted to sign as an actor, but they assured me that I would need a portfolio. I haven't been called to a single audition. So I have found auditions on my own and I am doing beyond well, and in July I am meeting with agents from LA. But I think everyone should get their money back. When I worked there, the comp card room was full. Meaning that no comp cards had been sent out. I and other potential talent and models were not even being looked at. Plus my agent (or what I thought was an agent) was very rude and flustered from a work overload. These people were friendly to your face so they could get money out of you, and then the next moment when you worked with them they were very different. I saw some things that I thought were strange, but I never ever asked, because these people did not like me. Their open calls were supposed to be selective. In other words not everyone who is invited is signed. I noticed that everyone who was invited to these calls were in fact signed. And not to be mean, but the majority of them did not have the potential to be a model, either for height, weight or level of attractiveness. So that obviously shows that they are just out to get vulnerable people's money. I am disgusted by all of this. The agents I am meeting with in July told me about Millenium Model Management and Model Search America and said that they were scams. They could not believe that I didn't receive any work, especially as an actor. Today I am a well-sought-after non-union actress and I am doing great. But I am mad at Millenium because they were supposed to get me auditions especially if I paid $1,500 for a stupid portfolio that was never even sent out! I want everyone involved to get their money back! 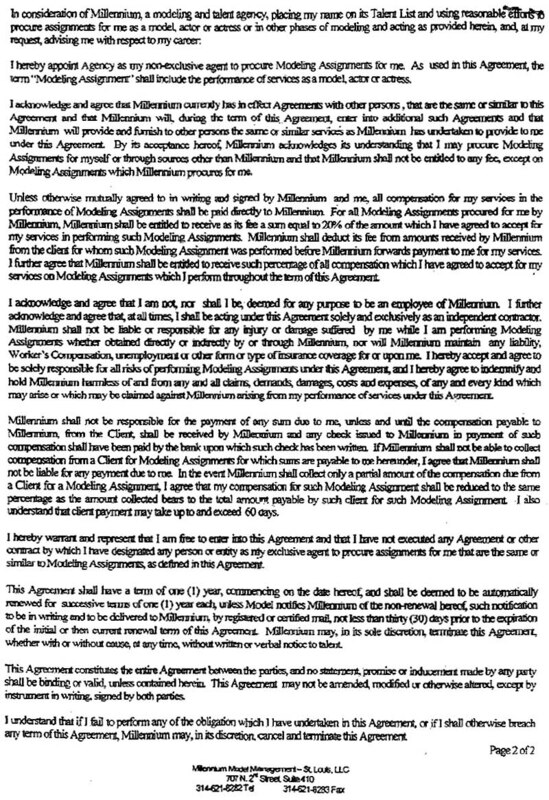 Concerned Parent: My daughter signed a contract with Millennium Model Management and they don't seem to do a whole lot for the $1,800 we are paying. Do you have any information on them? Admin: You are not supposed to pay a modeling agency for classes or photos. Reputable agencies train their models free and photography payments are made directly to the photographer after you interview and select the photographer. If you don't hire the photographer, you can end up getting photography at a quality far below what is professional. If you don't pay the photographer directly, you run the risk of the agency jacking up the price behind your back. 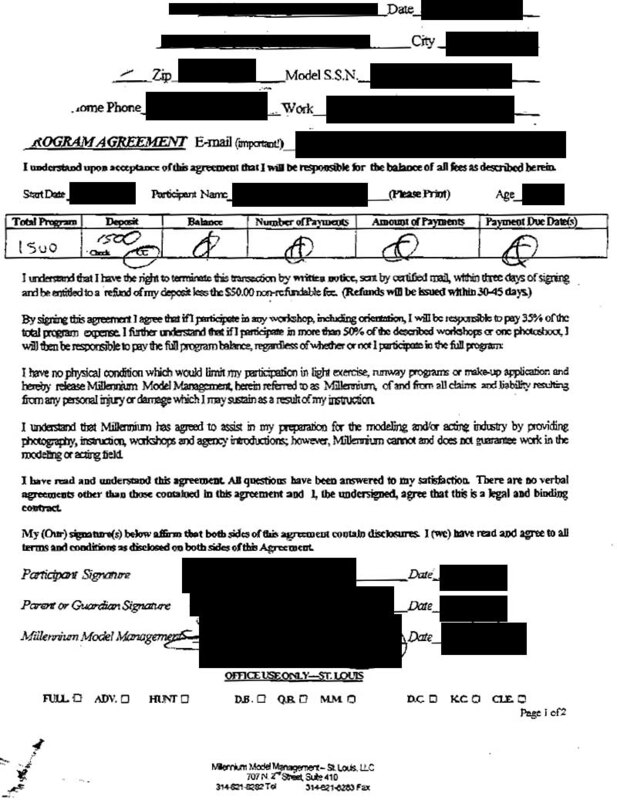 A photographer in NY said the model management firm for whom he took pictures charged models 5 times what he was paid. He was paid $300 per model; the agency charged the models $1,500 each. Training and photography are two conflicts of interest which, unchecked, have plagued the modeling industry for many years. A few years ago, the Federal Trade Commission, which is based in Washington, sued Model 1, which was based in Virginia. It was a modeling agency/school which collected about $1,500 from consumers for classes and photography. Model 1 and its partner company, Creative Talent Management (CTM), were sued together by the FTC. If [a girl] comes off the street into Elite and we think she has potential, she doesn't need to pay for classes. Somewhere down the line, she may take runway classes, which she doesn't pay for. We absolutely bear the burden. If a girl has talent and potential to become a model, of course, we help. It's a scam of [the model] paying $1,000 or $2,000. That's [expletive]! According to information provided by the company, Millennium Model Management provides representation for agency-ready models and a ten-session development program, for a set fee, that includes participation in a regional review with Model Search America. Consumer: I have a contract with Millennium out of Cleveland. Two years ago, I got a call back from Model Search America from Millenium. I paid $1,000 for a portfolio. Consumer: My sister's daughter, age 13, went to a modeling search in Cincinnati put on by Model Search America. She was one of the ones chosen to pay $500 to attend a modeling show in Columbus with a chance to go to New York. She was not chosen to go to New York. But about a week later, she got a call from Millenium Model Management. Their website address is: www.millennium-models.com. She went to their Cincinnati office and signed a contract with an agent who told her that she won't believe how her life is going to change now that they are her agent. Millenium Model Management encouraged her to go to training classes in Cleveland, and said that they are going to have a photographer fly in from New York to assemble a portfolio for her. There is no charge for the classes; however, the photos will cost $1,000.
" Steer clear of modeling companies that require you to use a specific photographer." Model: I saw a letter about Millenium Model Management, and I thought I would add my experience. I met with this agency at Model Search America. I'm from Pennsylvania, but Millennium insisted that I drive four hours to Washington, D.C., to meet with them, so I did. When I got to Washington, I had to read a short script and walk a runway in front of a room full of other potential models, parents, etc. There were 12 people at the audition, and they kept only two of us. They interviewed me separately after everyone had left, and said that I was a "B" model. They said everyone that they made leave were "C" models, and had no potential, but that to sign with them exclusively, I had to be an "A" model. Continuing, the photographer -- a very rude, angry, unprofessional man -- comes to Cleveland. Do we get our own shoot? No! There's about 20 of us that he takes out in a group. We have to do our own hair and makeup, and pick out our own clothes. The photographer takes no more than 10 photos in each outfit, making us choose our own poses. Let's see now, new models doing their own hair and makeup, choosing their own poses, and picking out their own outfits, with a photographer who apparently hates his job, and has to shoot 19 other people in that same hour... I bet you can guess how great those photos turned out. Anyways, they picked out five photos for my composite cards. When they came, I drove all the way back to Cleveland to pick up my cards... and they are all bent. They say there's nothing they can do about it. Then they urged me to put my photos online. An "agency" which is supposed to be "representing" me, and making money off me getting work, actually charged me almost $200 to be on their website. I'm actually on it now. Do you know how much work I've gotten from my comp cards and their website? None. Zero. I know about a dozen other girls from that agency whom I've met. Guess how much work they've got? None. I did one runway show that they sponsored, but you had to volunteer to do it. It was a weekend long, and it was the most unorganized event ever, and nobody got paid for it. However, every model in it was with Millennium, and it was the only job any of us had gotten from them. My advice: save your money. Today I model for a local agency which has provided me with a lot of work. I've done print work, promotional work, calendar work, runway work, web ads, and more. Send your photos out to legit agencies... as in, those who charge you NOTHING! Also, don't pay for photography... you can go to a reputable model-photographer network website and find a photographer who will do TFP (Time for Print). You work together, nobody gets paid. S/he gets to use your photos in his portfolio; and you use them in yours. I've done a dozen of them at least, and the photos have been just as good if not better than the ones I paid for. Consumer: I recently interviewed with Millennium Model Management in Vienna, Virginia. They said they liked me and wanted to sign me. However, they also wanted a nice sum of money for classes, photos, and registration. Admin: It is illegal in many states to charge registration fees. Call your Attorney General's Office to find out if it's illegal in Virginia. Sarah Doukas, Managing Director, Storm Model Management, once said: "Never, ever pay money upfront for anything." It seems Millennium Model Management is charging for everything upfront. Besides classes, photos, registration, and website advertising, what else could they charge you for up front?!! Why does MMM refer consumers to MSA? If MMM is competent, why don't they do what Exposure, Inc. does? Every "model management" company should also be a placement agent. "It is a placement agent’s job to promote a model and get her placed nationally. If a model has the potential to work in a national or international market, his or her local mother agency should be able to do the placement, or get them seen by the best agencies worldwide." Exposure, Inc.'s president will fly to NY at her expense to get her models signed. MMM, on the other hand, will stay at home, and send models to the MSA conventions at their expense. If test shoots at a world-renowned agency like Elite Model Management cost $250, why would you want to pay $1,000 at an insignificant company like Millenium Model Management? And if Elite fronts the money, why would you want to pay Millennium upfront? With the EMM arrangement you can't get burned. With the MMM arrangement you can. You could pay 1k in pictures but never get a modeling job. that, each person got called for an interview. need to pay for the photo shoot, which cost $895. asked her whether every contestant got this. pay in order to get the job. We signed in October, and so far all we have seen is the bill! I wish I had come across this website sooner. My daughter got a call from MMM... she interviewed in front of a group of other hopefuls, and got the second individual interview. This went just like it was scripted from all the other complaints I have read. Her "classes" were weak, but her photos and comp cards were good. I talked to a former model and photographer who knows the owner(s) of MMM, she said she did not think very highly of MMM. Biolage in the DC area. Thanks for posting so much relevant information in a clear way! to take comp card photos of me. through. They told me that they never turned anyone away. The truth is only about 2 or 3 had the 'look'... the rest were wasting their money. I resigned from MMM after my cousin got a 'postcard' invite to MMM. But then, Cassie was charged nearly $400 dollars more for publicity photos. A short time later, she was shocked to find the business closed. “I got out of the elevator and their office was dark.” All Cassie got for her nearly $2,000 dollar investment was a few photographs." The phone number for Millennium Model Management has been disconnected. We were able to track down someone who used to be affiliated with the company, who told us the company is no longer in business. Cassie plans to file a complaint with the Missouri Attorney General's office." 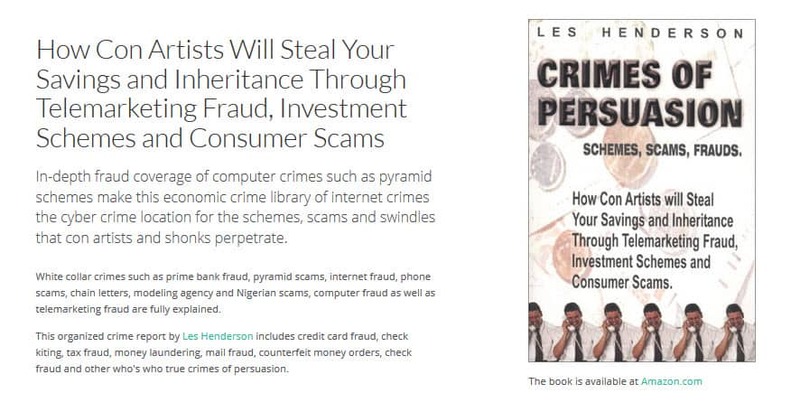 Watch out for the $$$$ you will have to spend before they "market" you. First they want at least a thousand dollars from you....to cover a photo shoot with one of "the best" photographers in the business...so they say. The $$$ also is to cover a few classes, which are a real joke, not taught by real coaches, just employees who may have gotten a job here or there , or are working off their own model accounts. When your pictures come back from the photographer, you will have to pay for the developing, and then you will probably be told they are not good enough for a comp card, and that you will have to shoot again, before they will market you or enter you comp card into the running. (another cost for the next greatest photographer and the developing cost on you again)(then they tell you tha people that make it shoot with at least three photographers-do the math it is all $$$spent before you get a decent $$$job) Oh, don't forget about all the bogus trips that you will have to pay for, to and from Tyson's Corner, VA. for a fifteen minute meeting. (If you are outside the DC/Va area, forget about it, get someone local) They market for people all the way into PA and NJ. They have open calls where they run ads on the radio and in the paper. They fill rooms with good looking people who are desparate to spend the thousand to get the chance that they make sound so promising. You'll also get a email about once a week letting you know of jobs that they have, half of which you will not qualify for because you either haven't finished your comp card payments, or becuse the deadlines are past by the time you get the email, or they are asking for some bizarre characteristics. They also make a big deal about sending the emails, half of which you can get online on your own with a bit of resesarch. Most of the work in emails is unpaid extra work for local Horror films or student movies. If you do get a big pic notice...again you will probably have to shoot more film before they will submit you. They will bait you with the lines about having lots of print work, and that you are just what they are looking for....stand outside on any given photo shoot date (saturdays) and see how many "just what we are looking for " people they have ready to sign up and pay the thousand plus dollars. They are a scouting agency who happens to get a few jobs here and there for people.That is the reality of the business, if they get one person a job, they can say they get work for people. Now, they will aslo try to play the responsibility off on you, IF you don't work hard enough (AKA spend more money with us on trips to VA and lots of photographers) you won't be geting the jobs. The reality is, if you look around the agency walls, they have only a few pics of the same "working girls" for the number of people they shuffle through their office, that is unacceptable. Oh, and forget about asking them to provide you with a list of satisfied, working models....they won't do it!!! Wonder WHY?!?!??!?!?!? Comments: $$$$ you will have to spend before they "market" you. First they want at least a thousand dollars from you....to cover a photo shoot with one of "the best" photographers in the business...so they say. The $$$ also is to cover a few classes, which are a real joke, not taught by real coaches, just employees who may have gotten a job here or there , or are working off their own model accounts. You'll also get a email about once a week letting you know of jobs that they have, half of which you will not qualify for because you either haven't finished your comp card payments, or becuse the deadlines are past by the time you get the email, or they are asking for some bizarre characteristics. They also make a big deal about sending the emails, half of which you can get online on your own with a bit of resesarch. Most of the work in emails is unpaid extra work for local Horror films or student movies. If you do get a big pic notice...again you will probably have to shoot more film before they will submit you. : They will bait you with the lines about having lots of print work, and that you are just what they are looking for....stand outside on any given photo shoot date (saturdays) and see how many "just what we are looking for " people they have ready to sign up and pay the thousand plus dollars. They are a scouting agency who happens to get a few jobs here and there for people.That is the reality of the business, if they get one person a job, they can say they get work for people. Now, they will aslo try to play the responsibility off on you, IF you don't work hard enough (AKA spend more money with us on trips to VA and lots of photographers) you won't be geting the jobs. my situation I would be very grateful. Small Claims Court is the venue of choice for most people who are scammed out of about $1,500.